Oh yes! 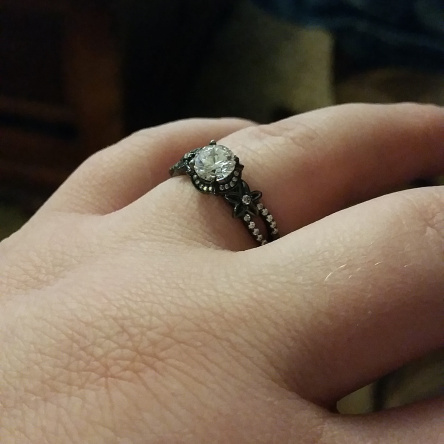 My boyfriend of three and a half years, got down on his knee and asked me if I would marry him. With both of us coming out of horrible divorces, we both had an understanding that we would probably never marry again, but we knew that we wanted to spend the rest of our lives with each other. So after we have all unwrapped our gifts on Christmas morning, he walks over on his knees and here I am, bedhead, pajamas, no makeup, preoccupied with posting the events of the morning on facebook. The kids are all playing with their new toys, and he says, “So, will you marry me?” And he hands me the most beautiful ring. Of course, I say yes after asking him if he was joking. Telling his family and mine over Christmas was amazing because everyone was very happy and thankful that we have taken this next step. When is the date? I say, after we save up, maybe two years. So, this now opens up a wedding planning section of my blog, which I am very happy about. I love this new adventure and I love that I have the opportunity to share this with all my friends and followers. Stay tuned and if you have any suggestions, comments, questions… tips and tricks, I am literally at square one and even though I was married before, we eloped, so I have NEVER had a wedding! So Marry Christmas to you and yours!